Karigan G’ladheon has just been suspended from her school for getting into a fight with an influential noble’s son. As she’s making her way home, she runs into a dying messenger who asks her to deliver his message to the king. She agrees, but what she thinks will be a simple journey turns into something much bigger when she is chased by agents of a mysterious power and encounters magic that she thought was long dead. 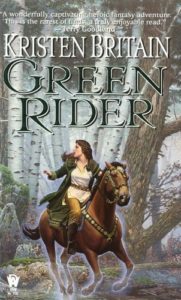 If I had one word to describe Green Rider, it would be “mediocre”. It is a pretty standard fantasy novel – we have the reluctant hero with latent magical powers, a long journey where the hero is chased by a representative of a long-dead evil, an intelligent mount, etc. In concept it’s probably most similar to Mercedes Lackey’s Heralds of Valdemar. I usually don’t have a problem with fantasy clichés (see my review of The Shadow of What Was Lost for example), but I don’t think this book ever rose beyond its clichés. Karigan was an extremely bland protagonist, even after reading the entire book, I couldn’t tell you anything about her personality. Other characters seemed to just do whatever the plot required of them. I don’t think I will be continuing with other books in this series.